We have all heard that eating fish is important for heart health. Many pregnant women however have been reluctant to heed this advice due to the mixed messages about the potential dangers of methyl mercury on their unborn children. The FDA is now attempting to clarity the confusion. It has just released its new draft recommendations stating that women who are pregnant or breast-feeding, as well as young children, eat a minimum of two servings or eight ounces of low-mercury seafood every week for their health. One 4 oz. serving is approximately the size of a deck of cards or an iphone. Even though nearly all fish contain trace amounts of mercury, the nutritional value of fish is so extremely important for growth and fetal development that the benefits of eating moderate amounts of fish outweigh the risks. Fish are a good source of protein, they contain minerals such as iron, and most fish are low in saturated fats. Fish contain varying amounts of omega-3 fatty acids and may also contain Vitamin D. It is healthier for mother and child to consume smaller fish like anchovies, mackerel, sardines, or herring. Smaller fish are more likely to be sustainable as they are lower on the food chain, carry fewer toxins and are nutritional powerhouses. Like the FDA’s recommendations we always recommend eating whole foods, as it is not possible to obtain the plethora of a food’s nutritional properties in a pill. 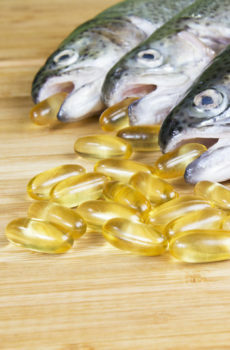 If you are not eating the recommended eight ounces of fish per week and choose to consume fish oil supplements to increase your intake of brain-boosting omega-3s, there are a few things to consider. There are tremendous differences in the ingredients, purity, freshness and therapeutic benefits of the fish oils available. Fish oils that carry Ecolabels that are IFOS™ third party certified and are from non-profit, non-governmental organizations such as Friend of the Sea, guarantee their products originate from both sustainable fisheries and aquaculture – a wise choice to ensure we have fish to feed and nourish the next generation. Our partner and one of our recommended Fish Oil’s is Sea-licious which is 5-Star certified by IFOS Program.